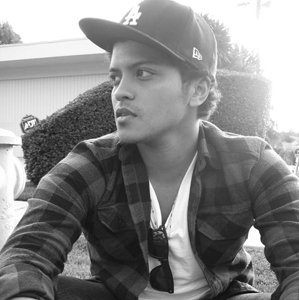 Peter Gene Hernandez, well known as Bruno Mars (american singer/songwriter/actor/producer). Becomes famous for participating in "Nothin 'on You" B.o.B and "Billionaire" Travis McCoy tracks. In 2010 he releases first solo album Doo - Wops & Hooligans. It, next "Unorthodox Jukebox" and 24K Magic has reached the Billboard 200 top positions! In 2014 gains Grammy Award as "The best Pop Album" for the "Unorthodox Jukebox" and more awards in 2018 for the 24K Magic (Record, Album and Song Of The Year) - so he's first male artist since Eric Clapton 25 years ago who unites this three awards in one year.